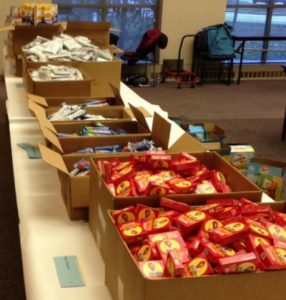 How It Works – Bulldog Bags, Inc.
Bulldog Bags, Inc. grew out of a movement by members of the Stow-Munroe Falls community, including school district and city officials, who recognized that some children in the SMFCSD did not have adequate meals on the weekend. Bulldog Bags, Inc. was incorporated and obtained its 501(c)3 status in 2015 to seek to reduce hunger on weekends for students in the SMFCSD by providing the students on the Federal Free and Reduced Lunch Program, or otherwise, qualified, with the nutritional equivalent of the Free and/or Reduced breakfasts and lunches that a child misses on the weekends. Weekend food programs for students are designed to supplement the students’ educational process. The link between hunger and education is undeniable. Children who go hungry are more likely to exhibit higher levels of anxiety, irritability, hyperactivity, and aggression, which affect all-around school performance. Research has shown that children participating in weekend food programs achieve better test scores, improved reading skills, positive behavior, improve health, and increased attendance. A Bulldog Bag is a bag of food that consists of breakfast and entree items, plus snacks, for the weekend. The items are nutritious, single serving size, easily opened and prepared, such an oatmeal packet, mac and cheese, canned fruit, raisins, etc. A personal care item, such as a toothbrush, toothpaste, or bar of soap, is included in the Bag, Bulldog Bags are provided to eligible children in grades K-9 in the SMFCSD TWO times a month. Nutritional menus are prepared and food is obtained through a Network Partnership with the Akron-Canton Regional Food Bank, local food retailers, and food drives. Ten to twelve food items are packed by volunteers into heavyweight plastic bags, along with a personal care item, generally on the second and last Fridays of the month during the school year. Bins of the packed “Bulldog Bags” are delivered by volunteers to the elementary, intermediate, middle, and high school buildings. School personnel distribute the Bulldog Bags to the children in a discreet manner to protect their privacy. High School: At the request of the counselors at the SMF High School, the Bulldog Pantry was established in September 2016 to provide lunch items to hungry students who have been referred to them . The program began in the summer of 2018 to help families whose children are eligible for the Free and Reduced Meal Program to stretch their summer food budgets when the children are home from school all day. A Bulldog Box consisted of 10 meals/snacks in family-size portions. Families registered in a confidential manner for the Bulldog Boxes and picked them up 1 time in June, July, and August. Ninety-eight (98) families were assisted; these families consisted of 173 adults and 202 children. The retail value of a regular Bulldog Box was $73.29 and a large Box for larger families had a retail value of $125.34. The Bulldog Boxes had a total weight of 4,149 pounds!